Naked cats don’t require different care than hairy cats, except for needing an occasional bath. Here are some pointers to make your experience easier. Because Sphynx, and other naked cats, do not have fur to absorb the natural oils from their skin they will require periodic bathing. The build up of oils in their coat will collect dirt and dust from their surroundings making them dirty. Depending on the amount of oils secreted from the cat, and the cleanliness of its surrounds, will determine the frequency of bathing. Some Sphynx need bathed more often than others. It's important not to over-bathe your cat, as it could cause an increase in oil production. I bathe my cats every month or two. Bath time should be fun for cat and owner alike. Because bathing is a routine part of having a hairless, it should be introduced to kittens and made as stress free as possible. Run your bath or sink water before bringing your cat into the room. Most nakeds tolerate bathing well, but if your cat is stressed by the experience, make bath time as quick as possible and wash their face and ears after you take them out of the water. Avoid getting soap into your cat’s eyes or mouth. Naked cats will get dirt between their pads and in the pockets of their claws. They can be clean out with a warm wash cloth or baby wipe. Cleaning of the paws will need to be done more often and in conjunction with their bath. I also keep Kleenex next to where I sit and wipe their claws while watching TV at night, when the cats are comfy and cozy, sleeping on my lap. The claws (front and back) will need to be clipped. In most cats you can see the quick inside the claw and you must be very careful not to clip on or beyond it. Begin by clipping off just the tip of the claw you can avoid causing your pet pain. SoftClaws have been a great asset as well. Hairless cats ears are hairless and produce a large amount of earwax. They will need cleaned in conjunction with bath time or about every two to three weeks. A couple drops of ear cleaner in the cat’s ears will make your cat shake its head and dislodge the earwax so that it can be easily removed with a cotton ball or Q-tip. Be very careful when cleaning their ears, and clean only as far in as you can see. You must provide your cat with a constant, always accessible, supply of cat food and water. Due to their higher metabolism (to keep their body temperature constant) they tend to eat more than a domestic cat. Using a premium pet food will limit the amount, and smell, of the kitties poos. Some people feed their cats a raw diet. Personally, I found my cats did not like it. This has to be a very personal decision. Of course the hairless cat is an indoor cat only - they sunburn! The general rule of thumb is...if you are comfortable they usually are too. However, if they get a chill, they are cleaver enough to find a warm spot under a blanket or curled up with another pet. 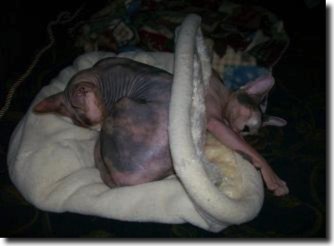 During cooler months, a heating pad or electric blanket is GREATLY appreciated by your hairless kitty! Maintaining regular vet visits and up-to-date immunizations will ward off most illnesses that would affect any cat. In general, the breed is very hardy with a normal cat’s lifespan. Neutering or spaying and providing an outlet for play, and the natural behavior of scratching (such as... scratching post), are essential elements for maintaining a healthy long life. Sphynx and other naked cats have been know to live fifteen years or longer. What is Hypertrophic Cardiomyopathy (HCM) & how we work to eliminate it? HCM is a common cardiac condition and is the most common heart disease in cats. One of the reasons we have outcross breeds (Elf, Dwelf and Bambino) is to minimize the odds of developing HCM by introducing new bloodlines. Although it develops and progresses over time, it’s early signs may be subtle or nonexistent. A cat that seems healthy may appear to become very ill very quickly, or even die suddenly after developing a blood clot in the heart, having displayed no symptoms of ill-health. A cat’s heart that is affected by HCM will have thickened left ventricle wall. Rather than growing larger outwardly, the walls of the heart grow inward, restricting the amount of blood that can be pumped through the ventricle. As the condition worsens, it becomes increasingly difficult for the heart to perform its job, and the heart eventually fails. All of our parents are scanned for heart disease and must scan clear twice before they are allowed to be part of the breeding program. Hairless cats have been described in many regions of the world, but the first successful breed was the Sphynx. The earliest Sphynx was born in 1966, and the cat was named Prune. However, Prune’s line died out without descendants. In 1967, hairless kittens, and their long haired mother cat were rescued in Toronto. The kittens were neutered; the mother, however, had other kittens. Two were exported to Europe, where one of the kittens was bred to a Devon Rex. The cat had hairless offspring which by Vicki and Peter Markstein at the Madison square garden cat show in the 1980s.implied that this recessive gene was at the same locus as the Devon gene[dubious – discuss]. Like with many purebred animals, over-breeding to promote desired traits can lead to health issues. At Free Range, we have used outcrosses approved by TICA in our Sphynx lines, and have extended our lines to include Elf, Dwelf and Bambinos, further removing the risks of HCM in our cattery. 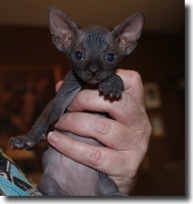 The Sphynx, Elf, Dwelf and Bambino cats appears to be a hairless cat, although it is not truly hairless. The skin should have the texture of Chamois leather. It may be covered with very soft hair that is often described as peach fuzz. Because the naked cats have no little to no hair to keep them warm they prefer to cuddle up against other animals and people, they even tend to cuddle up and sleep with their owners under the covers. Lack of coat makes the cat quite warm to the touch. Whiskers and eyebrows may be present, either whole or broken, or may be totally absent. Their skin is the color their fur would be, and all the usual cat marking patterns (solid, point, van, tabby, tortie, etc) may be found in nakeds too. Although Sphynx, or other hairless cats, are sometimes thought to be hypoallergenic due to their lack of coat, this is not always the case. Allergies to cats can be triggered by dander, and not cat hair itself. 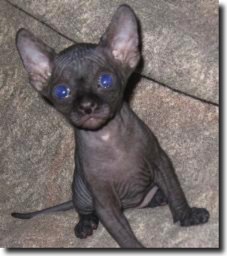 Although hairless cats have been reported throughout history (hairless cats seem to appear naturally about every 15 years or so), breeders in Europe have been working on the Sphynx breed since the early 1960s. The current American and European Sphynx breed is descended from two lines of natural mutations. 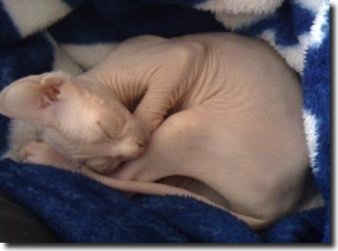 Q: Are sphynx cats hypoallergenic? A: Not always. Despite popular belief hairless cats are not hypoallergenic though they some people are not allergic to them. If a person is allergic to cat hair they will likely not have a reaction after interacting with a hairless cat. However a person allergic to cat dander or saliva will still have a reaction though it can be lessened by making sure the cat in question is bathed often. Q: What is the average life span of a Sphynx cat? A: Naked cats will live as long as any other breed, one of the oldest living cats was a Sphynx who was rumored to be 34 at the time of his death. His name was Grandpa and he was fed broccoli and bacon every morning. Not a diet we recommend, but it worked for Grandpa. Q: Do naked cats need baths? And how often? A: Yes they do. Most naked cats require a bath approximately about once a month, though some need more and some less. Every cat is different and produces oil differently. Q: Do sphynx cats get sunburns? A: Yes, so they’re indoor only unless you’re transporting them briefly. Q: Why are naked cats really hairless? A: Actually naked cats aren’t hairless. They have a thin down all over their bodies, some more than others. Their hairless appearance is caused by a genetic mutation that causes their fur not to grow. They can be sticky-bald all the way to velvety. They may have short whiskers, and a mask, tail-fuzz and “shoes”. Q: Should I put sweaters on my naked cat? A: That is up to your cat. Their normal temperature is 102 degrees. If they seem overheated or outright dislike the sweater, don’t leave it on. Many nakeds love to be dressed up. Q: My Sphynx cat likes to ride on my shoulder. Does he/she believe they are a parrot? A: Maybe, we've know an entire bloodlines of Sphynx cats that often ride on the shoulders of their humans. Sometimes they’ll groom us while they’re up there. Q: What kind of cat would be a good companion for my Sphynx cat? Q: My cat chews on his nails, sometimes it looks like he's trying to pull his toes off. Is this normal? A: Yes. They are cleaning their nails. Consider trimming them and making sure the whole cuticle area is nice and clean. Q: Do naked cats get cold? A: Yes. With the body temperature of 102, they’re warmer than us. In cold months, I put a heating blanket on the couch and they flock to it if they need the extra warmth. Q: Is catnip bad for my cat? A: Catnip is completely harmless herbs. Catnip is said to contain a chemical that resembles the scent of a substance released by whole females. You can even grow fresh catnip. They love it. Q: Why does my naked cat knead me, with his/her claws? A: Just like purring, kneading is a sign of happiness. It is a throwback to when they were kittens. Kittens knead at their mother's teats to speed the flow of milk. Purring usually accompanies kneading and adult cats normally knead when sitting on a favorite person's lap or settling down to sleep.